Likewise, non-defense discretionary funding, which supports everything from national parks to Head Start — and which was already slashed in the 2011 debt-limit deal — would almost certainly face deeper cuts than those required in the sequester. . .
[I]f the New Year’s Day changes remain in full force — the result would be sacrifice shared broadly among rich, middle-class and poor, and between domestic and military programs. Any bargain proposed to avoid the fiscal cliff should be judged against that standard." Read The New York Times, Bring on the Fiscal Cliff. UPDATE II: "Grover Norquist, who’s led the anti-tax movement on the right, similarly hailed the election as a victory and affirmation of Paul Ryan’s approach toward taxes and the budget." Read the Washington Post, How Republicans are trying to look on the bright side today. Fiscal cliff here we come! UPDATE: "If all you wanted to do was to reduce the deficit as quickly as possible, here’s one very simple way to get it done: Go off the fiscal cliff. Do so would result in about $720 billion in total austerity in 2013, and it would bring down the deficit that year in some of major ways, including $180 billion from income tax hikes, $120 billion in revenue from the payroll tax, $110 billion from the sequester’s automatic spending cuts, and $160 billion from expiring tax breaks and other programs, according to Bank of America’s estimates." 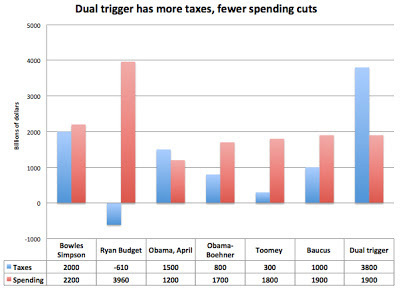 Read the Washington Post, The fiscal cliff would cut the deficit by $720 billion in 2013, but even deficit hawks hate it. "If the Obama administration were to really lay out their plans, they would go something like this. In November, President Obama will reiterate, clearly and firmly, that he will veto any attempts to extend the high-income tax cuts or lift the big, dumb spending cuts without finding equivalent savings elsewhere. In fact, as my colleague Lori Montgomery reports, they’re already reiterating that promise. That veto threat is the center of the Obama administration’s second-term strategizing. The Obama administration believes – and, just as importantly, they believe Republicans believe — that they’ve got the leverage here. 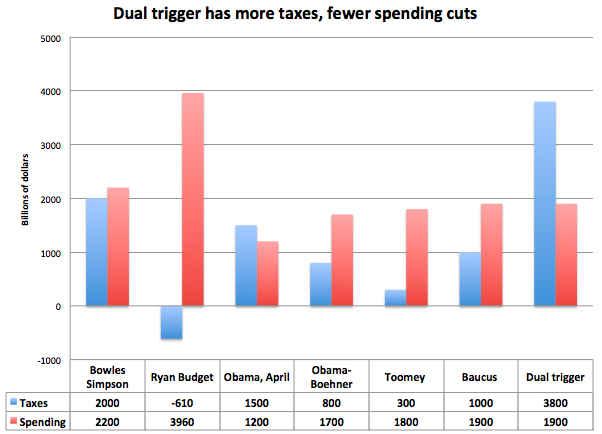 The Republican position on taxes is less popular than the Democratic position. The outcome of gridlock is much higher taxes, which is more anathema to Republicans and arguably cheering to Democrats. The big, dumb spending cuts, despite being poorly timed and inanely constructed, are very progressive in their effect, falling heavily on military spending while exempting Medicaid, Social Security, and Medicare beneficiaries. I’ve called this the GOP’s dual-trigger nightmare. It’s bad for the economy, but it also effectively ends our deficits with a mix of tax increases and spending cuts more progressive than anything any Democrat has dared propose. Republicans absolutely can’t let it happen. But the only way they can stop it from happening is to make a deal." You might remember, almost a year ago I discussed 'the GOP's dual trigger nightmare' and asked: Did Obama Con the Republi-CONs?